Our body performs thousands of repairs every day with the micro-current it produces itself. Skeen Patch Body Wellness is a miniaturized medical device that provides micro-current dosed and cadenced to respect our biology while it boosts our natural healing capacity. This innovation is unprecedented and there is no alternative of the same level. It’s good to understand that the micro-current up to 650 μA increases the rate of ATP synthesis and allows – according to the subjects, since it is our own biochemistry which is activated – a process 3 to 6 times faster at level of tissue repair and regeneration of our cells. In summary, your body goes back to its most powerful potential. Thanks to our long-studied and patented micro-current regenerative programs, MCR : Skeen Patch accelerates the regeneration of cells and thus allows a better repair, a body reinforcement and an immediate relief of pain symptoms. A real revolution for the continuous and completely natural care of our body! For general public use, at home or anywhere, without danger or side effects. Skeen Patch Body Wellness is effective and easy to use. Skeen Patch Body Wellness is a French patented product. Skeen Patch is a medical device, as such it has the CE marking which certifies its compliance with the essential requirements of the Medical Device Directive 93/42 / EEC. SKEEN PATCH Body Wellness, invented by french doctors, has been nominated 2 years in a row at the prestigious GALIEN AWARD of Medicine 2017 and 2018. These awards selection guarantee the recognition of the medical profession, innovation, seriousness and efficiency of the SKEEN PATCH. Our body is an extraordinary biological machine. Every day it has to renew our cells by millions and repair our body. With fatigue, time, incidents, this incredible mechanism struggles, starts to make mistakes and when it becomes entangled, it derails, causing functional anomalies. Skeen Patch always helps our body to overcome difficult passages and reactivate its functions to its optimum. By relieving fatigue temporarily and providing the necessary micro-current, Skeen Patch Body Wellness allows a crucial recovery when our body is overloaded or in difficulty. Even perfect, our biology sometimes needs a little boost. Skeen Patch Body Wellness is, in this field, a unique treatment. Skeen Patch Body Wellness helps better and faster wound healing. The healing of accidental wounds or as a result of surgery is always delicate. Too weak or too slow, it can lead to unsightly gaps or depressions. Conversely, too strong or too fast, it can become keloid both unsightly and irritative. In addition, edema and hematoma slow down, or even complicate, healing. 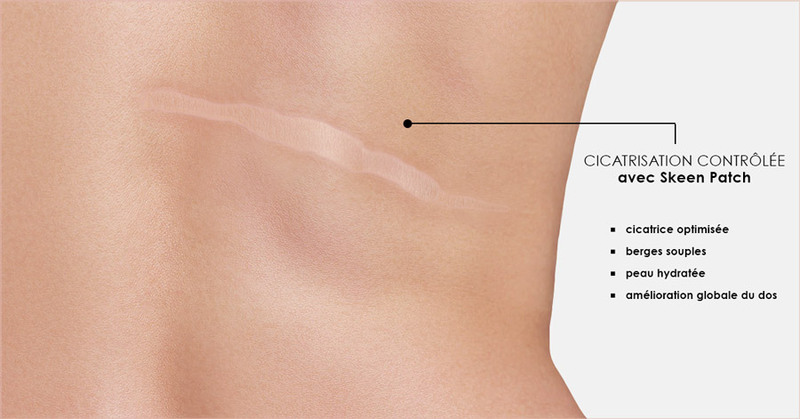 This prevents quality scarring : that is, a soft and virtually invisible scar. In most cases, scarred wounds leave unsightly traces that never subside. In this area, Skeen Patch Body Wellness is absolutely formidable: it harmonises the healing time of wounds, whatever their origin, by making it well dosed: neither too slow nor too fast. The healing process starts from the first sessions. Under the micro-current effect, the blood circulation is excellent. Edema, inflammation or hematoma are gently removed but much faster to allow the body to start repairing itself. Efficiency is optimal. Cell regeneration is optimized and keeps the wound edges flexible, allowing a very good quality healing. 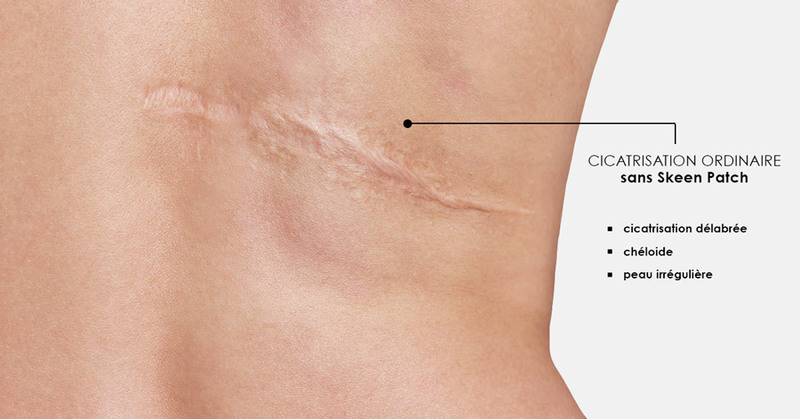 We call this “controlled healing” and in this exercise, Skeen Patch Body Wellness is simply unique : the skin is in perfect condition and the scar will become, in most cases, invisible. During the healing phase – which can last up to 21 days or more – do not expose your wound to the sun, the UVs would be responsible for hyperpigmentation of the wound which, then, turns brown! Our expertise in “controlled healing” is the result of years of using Skeen Patch Body Wellness in hospital environment. Skeen Patch Body Wellness heals well and fast, even in complicated and difficult contexts. Varicose ulcers dry up and heal well in 2 to 3 weeks: never seen before! Skeen Patch Body Wellness can be used with 4 electrodes or just 2 electrodes if the injury is small. Beyond 65 years old, it is strongly recommended to make a cure of Organic Silicon in conjunction with Skeen Patch Body Wellness in order to increase the cell repair potential, strengthen the collagen, elastin, the level of hydration of the skin, providing the essential conditions for a beautiful skin. Skeen Patch Body Wellness is a valuable ally for people whom suffer with heavy legs, swollen legs, frequent hematomas, marbled legs, who want to prevent the appearance of varicose veins, edema and complications. The regenerative micro-current stimulates blood circulation and venous return, drains water retention, strengthens the tonicity of the vessel walls and the muscles work, quickly resorbs blue, hematoma and inflammation. Skeen Patch Body Wellness can immediately relieve discomforts, reduce gradually and permanently the tingling sensation and swelling, strengthen the venous system. The deflation of swollen legs or ankles is rapid, visible after each session. These results are reliable and systematic. If you do not treat these symptoms, complications due to venous insufficiency occur over time, such as thromboses, phlebitis or varicose veins ; they may provoke, by aggravating, varicose ulcers and necroses of the tissues. Skeen Patch Body Wellness is essential for those who have systematic problems after a flight, legs that swell during hot weather or those who stay for long hours sitting or standing, in order to prevent possible phlebitis (blood clot). 18 million people, 1 in 3 people in France, suffer from poor blood circulation and venous insufficiency. If you are already in a state of varicose ulcers, know that Skeen Patch Body Wellness heals them in less than 1 month, instead of the usual 4 to 5 months. For those who suffer from impatient legs, Skeen Patch Body Wellness can remove the pins & needles, tingling, burning sensations, to find again comfort and calm. In the long term, Skeen Patch Body Wellness can completely eliminate these symptoms, all related to venous insufficiency : its effectiveness in this treatment has been demonstrated for several years in hospitals. Cultivating a healthy lifestyle, walking or doing water aerobics will, of course, increase the results and benefits of the micro-current. Its advantage of being portable and small, to be able to follow you everywhere, at home or at work, on a business trip or on holidays, makes it a particularly suitable care. Skeen Patch Body Wellness will very naturally become your new well-being reflex. A backache, tension, a wrong movement, a cricked back, a blow, … your body is painful and stiff. Chronic back pain is widespread: in France, there are more than 2 million people affected. Medications for back pain don’t solve this condition, which often becomes chronic and disabling. Throwing yourself on painkillers is not the best reflex, you cover the pain instead of treating your back pain which is complex, insidious and your condition will only get worse, domino on the rest of your body, if you don’t treat it. It is imperative to relax your muscles, strengthen your muscular endurance and your heart adaptation to the daily physical efforts your body, paralyzed and sore, has been putting off for months or even years. The unique program of neuro-stimulation by regenerative micro-stimulation of Skeen Patch Body Wellness is incredibly powerful in this area. Without forcing, you will be able to decontract your back, forestall the process. The results are sensational to fulfill the requirements of a chronic back pain treatment. The Skeen Patch micro-current stimulation is extremely complete and covers 3 important work levels that allow a fast and lasting recovery thanks to a real physical reinforcement. First, SKEEN PATCH Body Wellness softens the contracted muscles of the back , then, it strengthens muscular work and finally, it prepares your back for cardio-muscular endurance for your physical activities, whether it’s for everyday life or sports. The regenerative micro-current provides incomparable body relaxation and 100% restorative sleep. The use of Skeen Patch BodyCorps does not require any pharmacological or cosmetic additives. Your muscles have been relaxed and strengthened, your stride is longer, you walk faster, your movements are more flexible, more slender, you are less inclined to hurt yourself. Used regularly, SKEEN PATCH Body Wellness not only restores your ability to move but also increases your functional abilities and your performance. That’s why SKEEN PATCH Body is used in the best specialized functional rehabilitation services of the SPINE. For this type of treatment, you will need 4 to 6 electrodes for the 3 different poses on the back: the first to treat the entire back along the backbone, or more targeted, shoulders / neck, the last one on the kidneys. Skeen Patch Body also acts on any part of the body that stab you muscularly, a tennis leg, a wrist, a painful knee, a cramp … It soothes you locally and deeply. Caution, consult your doctor if your symptoms persist beyond 4 days. You feel first, a general tiredness and dizziness, then, headaches, buzzing ears, disturbances of the sight and finally, a permanent stiffness of the neck and of the upper back, accompanied progressively by a depression. When the neck is stiff and your upper back is blocked, destabilizing health problems come together and are, finally, many noisy symptoms for a single cause: some intense muscles and nerves tensions saturate the neuralgic crossroads between your body and your head. Skeen Patch Body Wellness relaxes and quickly dissipate the stiffness of the upper back and neck, gradually erasing all symptoms. It can treat headaches and cephalgia, general fatigue, insomnia, pitching & vertigo. The micro-current spreads both as a massage, providing peace and immediate relaxation, but also as a sleep repairer and an unlocking of biological causes or also stress. Your body is revitalized, rebalanced, toned, allowing an exponential recovery at the mental and psychic level. Skeen Patch Body Wellness offers you: calm, relaxation, balance, unparalleled overall performances, you gradually find an excellent form and mental health. Tensions, stress, insomnia … all of this accumulates intense fatigue and your body no longer follows. The hardest thing, when you reach the end of the rope, tired, is to think about it! Who would believe that a simple boost of energy for your body would do so much good … From the first session, you sleep better, you feel more relaxed and gradually find back your tonus. Skeen Patch Body Wellness works on an exhausted body in a fabulous way. Its effect on the spine and neck gradually restores your body’s form, gives you energy. Do it before you go to sleep and if possible in the morning, you will begin the day with more peps. The burnout should not be taken lightly. You are nibbling at your reserves, you are in the red zone: you think and work less well, you consume more stimulants, you are more prompt to errors, a poor coordination of your body and it will make you pay for it, one way or another. Take care of yourself ! During the first session and from your state the day after, you will clearly understand the benefits. The most difficult thing when you are in this kind of fatigue is to realize that a very simple gesture will do you a huge good and gradually revitalize you. Taboo subject, unfortunately, know that urinary incontinence is widespread and affects all ages. It is a neuromuscular dysfunction of the bladder causing involuntary losses or leaks that spoil the daily life and cause a whole organization around this inconvenience. For people who are affected and who remain active, this requires to wear protections. At the stage of chronicity, urinary leaks is a major handicap. These disorders, urinary stress incontinence, urge or mixed incontinence, have been, since 2014, at the heart of our research to provide a real solution of which we are very proud: a return to the normal bladder functions through neuromuscular rehabilitation. A 15 sessions cure, usually, at a rate of 1 to 2 sessions per week, has proven on several patients its ability to drastically reduce leaks and, for cases of stress incontinence, to no longer have any at all. Urge or mixed incontinence takes longer to heal, but 60% of cases show clear improvements. Once the leaks disappear, you only need 1 to 2 sessions per month for a period that depends on the seniority and the severity of your incontinence to maintain the care and sustain it. The results of neuro-muscular bladder rehabilitation with Skeen Patch Body Wellness are simply amazing: most people treated are delighted because they are finally able to get rid of urinary leaks and return to a serene life. Our first researches since 2000, formalized in 2015, led us to treat facial paralysis, radial paralysis of the hand, paralysis of the foot lifter or paralysis of the bladder. In this very specialized area of peripheral paralysis, our researches work, our discoveries about the mechanism of nerves and muscles blockage and our successful treatments by Skeen Patch Body Wellness are unique in the world. We were able to treat where everything seemed hopeless and impossible. Thanks to Skeen Patch Body Wellness, our patients were able to evolve from the stage of handicapped to the normal mobility stage. This progress is a tremendous joy for doctors, and of course for patients. In 2017, we were nominated for the prestigious GALIEN AWARDS of Medicine 2017. And in 2018, very exceptional, our work is again nominated at the same prestigious GALIEN AWARD of Medicine 2018. We pursue our work with perseverance and we dream of making paraplegics walk again. At the same time, we are working on Skeen Patch Body Wellness new devices, connected and autonomous, endowed with artificial intelligence, which will allow a phenomenal advance for the well-being and the care of the patients.